Originally appeared at Jacobin, on April 19, 2019. The class war over Medicare for All is here. 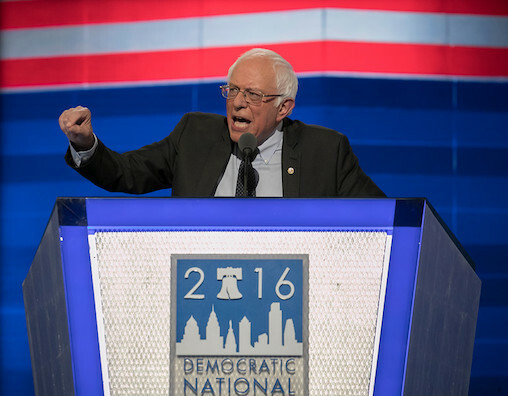 On one side is Bernie Sanders, who recently introduced new and improved Medicare-for-All legislation with the support of a burgeoning grassroots movement and historic small-donor fundraising. On the other side is UnitedHealth, the massive health care company — the fifth-largest US corporation by total revenue of any kind — whose stocks have been plummeting since Sanders revived the bill. Originally appeared at Common Dreams on March 25, 2019. 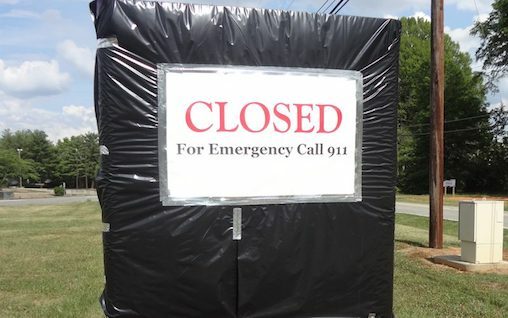 We’ve got a rural health care emergency on the horizon. Rural hospitals are closing or teetering on the brink of closure at an alarming rate. More than a hundred have closed since 2005 and hundreds more are on life support. Long-term care facilities are vanishing across rural America or being bought up by large corporations who care about profit, not the care of our loved ones. Most rural hospitals have even stopped delivering babies — you’ll need to go to the city for that, so plan ahead. I know firsthand. I’m a registered nurse and lifelong Iowan from the country. I’ve kept a close eye on where we’ve been with health care, and where it appears we’re headed. It’s not looking too good for my community and others if we stay on our current failed path. Medicaid expansion was supposed to help here in Iowa. It sure didn’t — because we handed the program over to private, for-profit “managed care organizations.” What we got in return was less care — and more services denied, facilities shuttered, and lives lost to corporate greed. 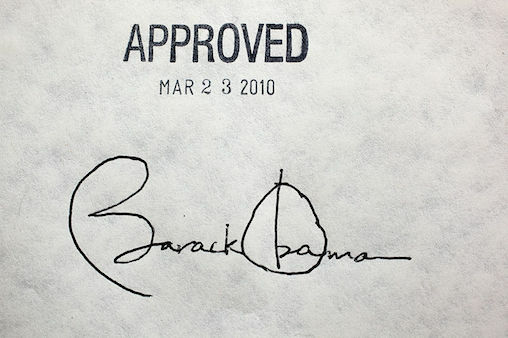 President Barack Obama's signature on the Affordable Care Act, March 23, 2010. Wikimedia.org. With the 2020 election season beginning to heat up, corporate money-fueled Democrats, along with think tanks, like the Center for American Progress, have begun their full-court press against Medicare for All. We’ve seen a myriad of bad faith criticisms of Medicare for All from these camps over the last several months: it’s too expensive, too divisive, or it’s a nebulous, poorly defined concept. These are ridiculous criticisms that have been well-dispensed with elsewhere. It’s equally important, however, to examine the positive case being made for the M4A alternatives rolled out by lawmakers like Representative Nancy Pelosi and Senator Brian Schatz. It’s critical for socialists to evaluate these cases and respond to them, so as not to find themselves constantly on the defensive. Doing so allows us to examine the faulty logic underlying these proposals, and rearticulate our positive vision for universal, comprehensive, and free healthcare for everyone in the country. One thing that will immediately jump out to any attentive reader is that in talking point after talking point, the same few themes crop up. 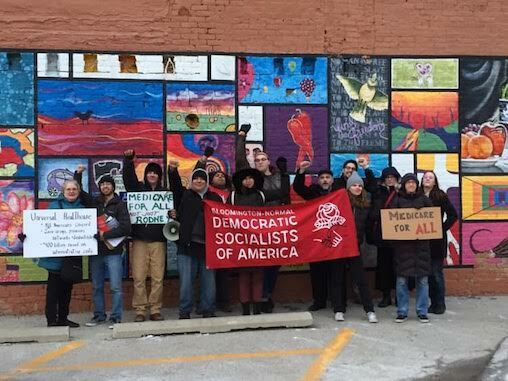 Chapter Spotlight: Northern Indiana DSA Barnstorms With NNU Towards Success! 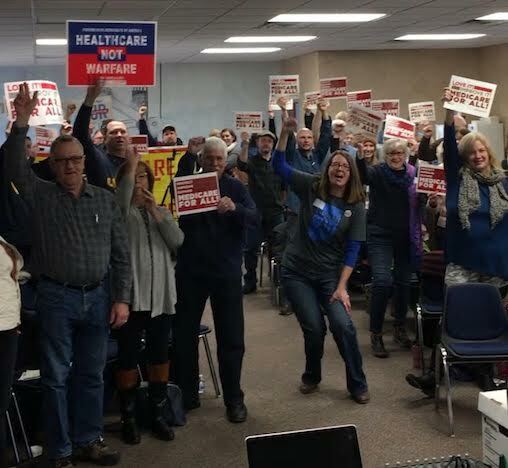 On February 9th, 2019, NWI Medicare for All held a barnstorm event sponsored nationally by National Nurses United to win Medicare for All. We had over 65 attendees, many of whom were local activists including union members, Progressive Democrats of America members, DSA members and Green Party members. We are grateful that the United Steel Workers Local 6787 in Chesterton lent use their hall for the event. The goal of the event was to organize folks to participate in future phone banks and canvassing events, as well as to move our local member of Congress, Representative Pete Visclosky, to co-sponsor H.R. 1384. The attendees signed our petition, wrote postcards to Pete and jotted down his phone number when we urged them to call his office. We called his office in front of the crowd, put the phone on speaker and asked the group to shout "Medicare for All" on the voicemail. It was a really high-energy and fun event; we had food, give-aways and people shared powerful stories as to why they fight for M4A. A few days later, the NNU contacted us to let us know that Pete signed on as a co-sponsor to the Medicare for All Act. Originally appeared at Peoples Policy Project on March 21, 2019. 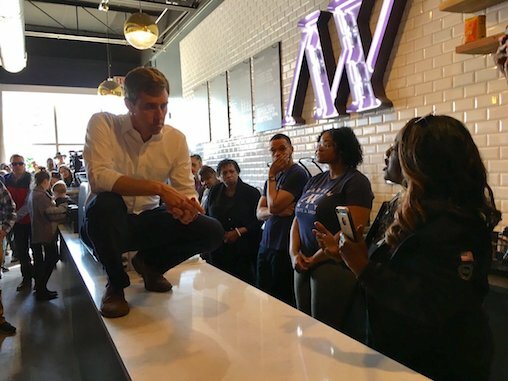 The floor is Medicare for All. Paul Krugman has a piece in the New York Times where he tries to compare Medicare for All to Medicare for America. The piece provides good insight into the developing centrist consensus on these matters, including its heavy reliance on straightforward falsehoods. The sole argument Krugman uses to favor Medicare for America over Medicare for All is that the former lets people keep their current insurance if they want. This is objectively wrong. To me, then, Medicare for America — which lets people keep employment-based insurance — looks like a much better bet for actually getting universal coverage than Medicare for All. Originally appeared at Jacobin, on March 22, 2019. 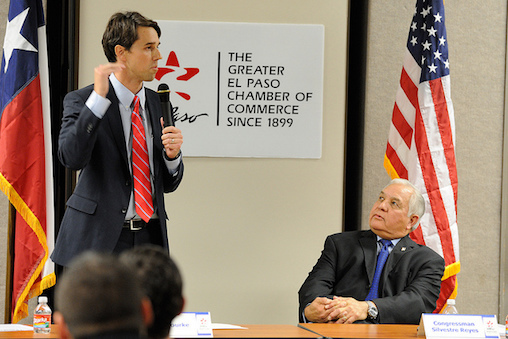 Beto O'Rourke speaks at a Chamber of Commerce candidate forum in El Paso, TX, in January, 2012. Flickr/Beto for Congress. What do the Democratic candidates for president believe about Medicare for All? With the exception of Bernie Sanders, it’s hard to say. Kamala Harris has backpedaled. Cory Booker contradicts himself. Elizabeth Warren has a wavering record and avoids the subject as much as possible. Meanwhile they all support competing legislation on the side. Beto O’Rourke’s reversal is the most flagrant yet. In a mere two years the former Texas congressman has gone from vocally championing Medicare for All to bizarrely calling the single-payer policy “too ideological.” O’Rourke’s stance on health care policy has been so unclear that a Vox reporter felt the need to conduct an investigation into it. After a career of noodling around on the issue, he seems to be zeroing in on his favored approach now that he’s running for president. O’Rourke is touting a proposal called Medicare for America, a public option bill modeled off of previous work by neoliberal think tank Center for American Progress. 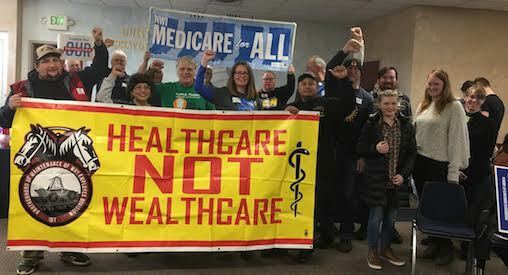 In the week that preceded Representative Pramila Jayapal (WA-7, D) introducing the Medicare for All Act of 2019 (with over 100 cosponsors), the members of Bloomington-Normal’s Medicare for All working group drafted and sent a letter requesting a meeting with Representative Rodney Davis (IL-13, R). The twin cities of Bloomington and Normal are both split between districts 13 and 18, represented by Rodney Davis and Darin LaHood. Neither candidate has made any indication that they would support a Medicare for All bill, but we felt it was prudent to request a meeting with both of our representatives through the candidates’ preferred contact methods. We sent both an email and a letter and requested a reply by March 4th. By our proposed deadline, we received no acknowledgement of our requests from either candidate. ALL IN: March; All About the New M4A Bill! ﻿We have much to celebrate, because we just achieved an amazing milestone together: Rep. Pramila Jayapal (D-WA) introduced the Medicare for All Act of 2019 with over 100 cosponsors on Feb. 26! You can watch a recording of the bill’s release outside the Capitol building here. The importance of this landmark legislation cannot be overstated, and we’re going to continue working alongside our coalition partners to make Medicare for All a litmus test for all candidates in 2020. Big pharma, insurance industry lobbyists and career politicians will certainly redouble their efforts to spread misinformation and kill M4A, so we can’t let up. We’ve got a real, fighting chance to achieve Medicare for All! 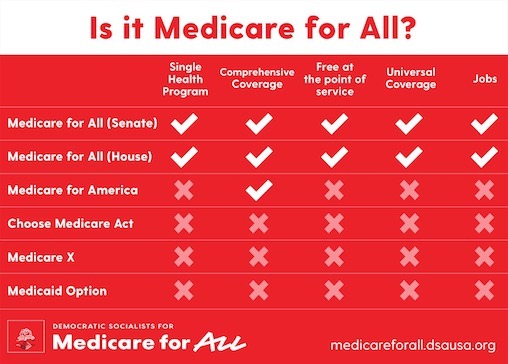 Medicare for All and Nothing Less! From our campaign Organizing Resources. A single health program: Everyone will be covered by one health insurance program, administered by the federal government, and have equal access to all medical services and treatments. Comprehensive coverage: All services requiring a medical professional will be fully covered. You go to the doctor of your choice. Dental, vision, mental health, and pharmaceuticals are all included. Free at the point of service: All healthcare costs will be financed through tax contributions based on ability to pay: no copays, no fees, no deductibles and no premiums. Ever. Universal coverage: Coverage for all United States residents — non-citizens included. Jobs: A jobs initiative and severance for those affected by the transition to government-run healthcare. The two Medicare for All bills—one in the Senate and one in the House— are both true pieces of single-payer legislation. As written, they would enroll every American resident in a single, national insurance plan. Healthcare would be delivered free at the point of use and the program would be funded through progressive taxation, meaning no more copays or deductibles.